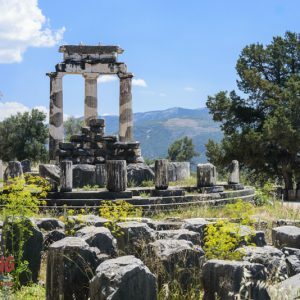 A quick and unpredictable tour to some of Greece’s most important classical sites, like the historical landmarks of Mycenae, Ancient Olympia, Delphi and Meteora. Enjoy breathtaking views of Greece’s varied nature. Discover less known spectacular sites, scents and tastes of the Mediterranean. 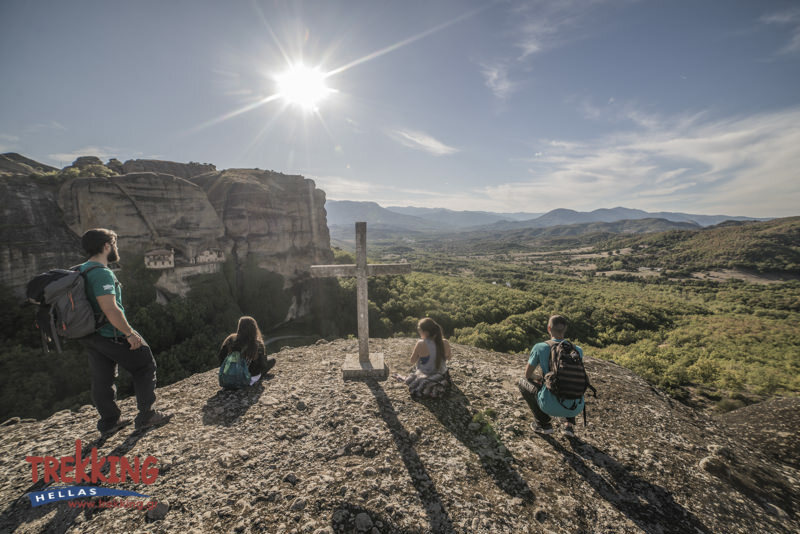 Do more in less time: visit some beautiful landscapes on a light hike, have a wine tasting experience, or even some adrenaline action repelling in Meteora. 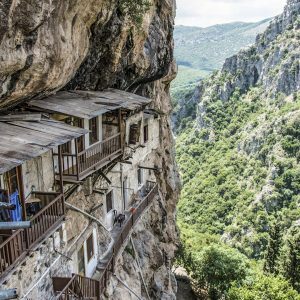 Experience the authentic part of Greece away from the tourist masses: enjoy the unique atmosphere of small taverns and the friendly hospitality in boutique hotels. Feel like home in Greece, and create a strong bond that will make you want to come back again and again! Entrance fees to Mycenae-Epidavros, Olympia, Delphi, 2 monasteries in Meteora, Professional licensed guides in Mycenae-Epidavros, Olympia, Delphi. We leave the lively city of Athens and head to Nafplio. We make a short stop at the Corinth Canal, the six-kilometer waterway connecting the Ionian and Aegean seas. We make a small deviation from our route, to visit a winery visit in Nemea, famous for its “Agiorgitiko”, one of the finest Greek red varieties. Agiorgitiko variety has grown for many years in the wider area of Nemea (about 6,700 acres), where it is said that the famous red wine of Fliasion was produced in antiquity (4th century BC). We continue our scenic drive to Nafplio. Considered one of the prettiest towns in Greece, Nafplio was the first capital after independence and has been a major port since the Bronze Age. After settling in our hotel, we visit the old town of Nafplio for an evening stroll and dinner in the charming old town. Distance: Total driving including Nemea 260Km’s, about 3 hours’ drive. Today we explore some of the best preserved and world-known sites of Greece, Epidaurus and Mycenae. Early in the evening, we continue to a less touristy but very inspiring mountainous region in central Peloponnese, renowned for its rich in historic villages like Dimitsana, Stemnitsa and Karytaina. Distance: 110Km’s, about 1,5 hours drive. We hike in the inspiring Lousios Gorge. 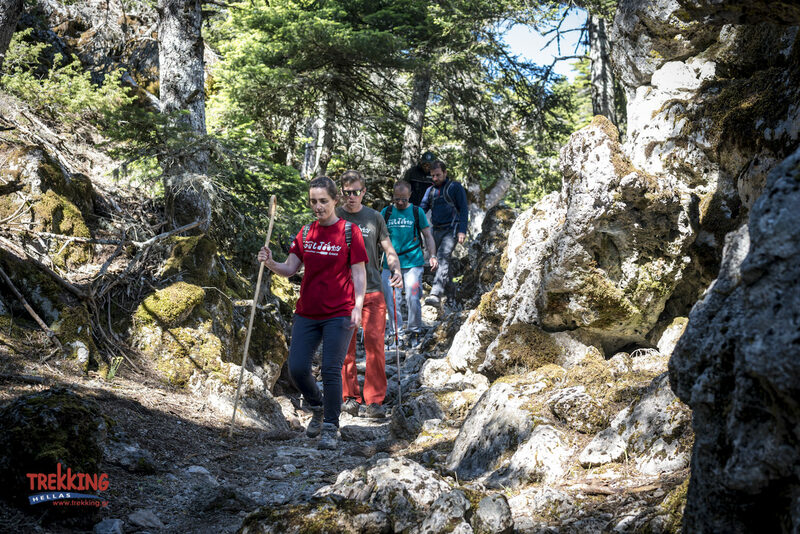 A trek into untouched nature following the path of history. 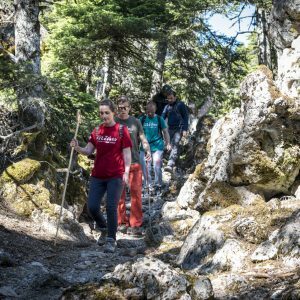 We walk in trails parallel and through Lousios river gorge, also known as the “Mount Athos of the Peloponnese”, on account of the many monasteries that appear to be literally hanging from the cliffs. We enjoy a traditional Greek lunch, and then we continue our journey to Olympia. O/N in Olympia (B/L/D). Distance: 80Km’s, about 1,5 hours drive. The site of Olympia is one of the largest and most beautiful sites in Greece. We walk with our guide through the valley of wild olives and plane trees to the Ancient Ruins. Walking under the frame of the great temple columns we feel the awe of the Olympian history. We visit the Sanctuary of the Olympian Zeus and the Museum. 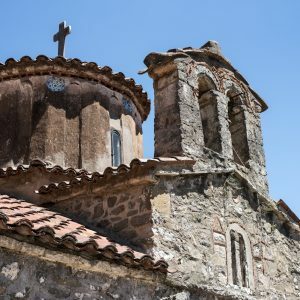 As this is one of the most important historical sites in Greece, we spend a comprehensive guided tour, and some free time to enjoy the ambiance of the sight. In the afternoon we head towards Patra and drive through the impressive bridge over to western Greece via the “Little Dardanelles” from Rio to Antirio. Once we cross over we drive through the picturesque town of Nafpaktos and finally arrive via a beautiful coastal route to Delphi. Distance: 240Km’s, about 3,5 hours drive. We follow the ancient footpath, from the slopes of Mt Parnassos in a forested route to the village of Delphi. 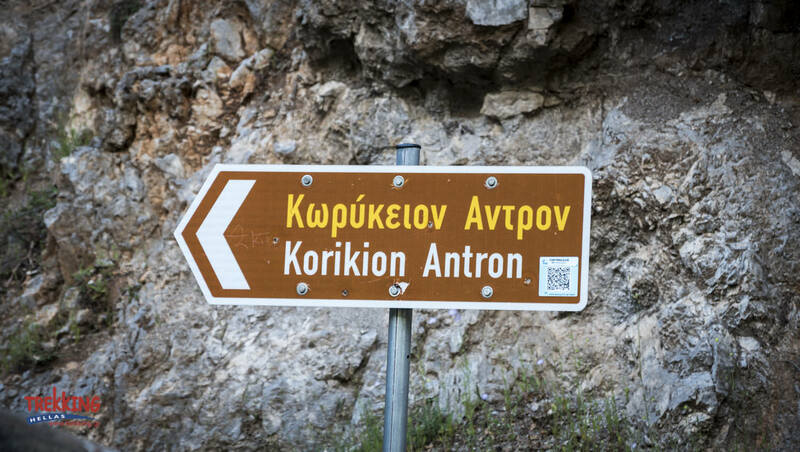 The same footpath that took Pan’s worshippers up from the ancient temples of Delphi to the Corycean Grotto to celebrate rites, which is now a part of the E4 European trail. We start at Livadi plateau at an altitude of 1200m. 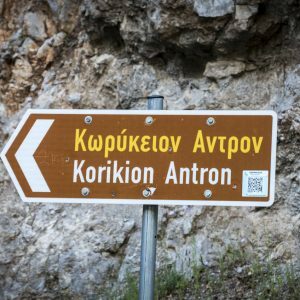 We descend to Delphi sanctuary overlooking the olive trees valley and the Corinthian Gulf, whilst the mountains of the Peloponnese complete our picturesque scenery. We stop, en route, for a picnic in a traditional sheep barn, near the cave of Pan. 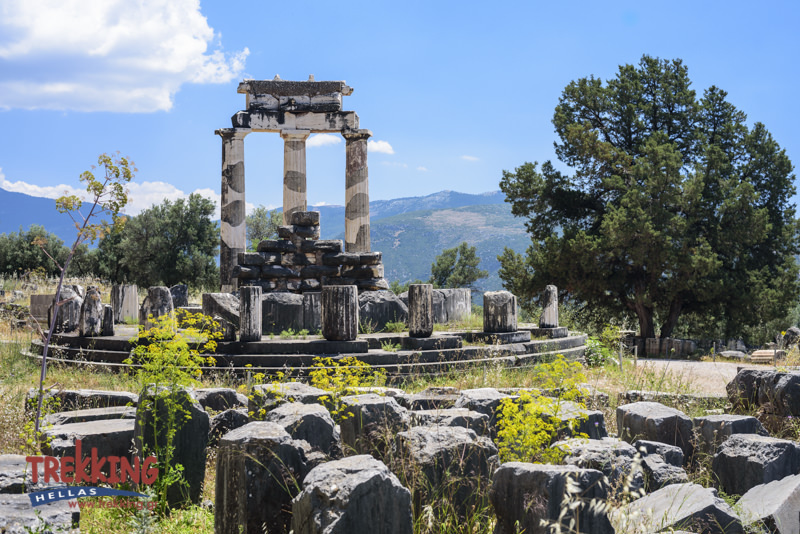 We reach Delphi and visit the actual archaeological site and museum, a world heritage monument according to UNESCO, with a professional guide. Amongst others, we visit the Treasury of the Athenians, the Temple of Apollo and the museum which contains masterpieces such as the Bronze Charioteer and the image of the famous athlete Aghias. 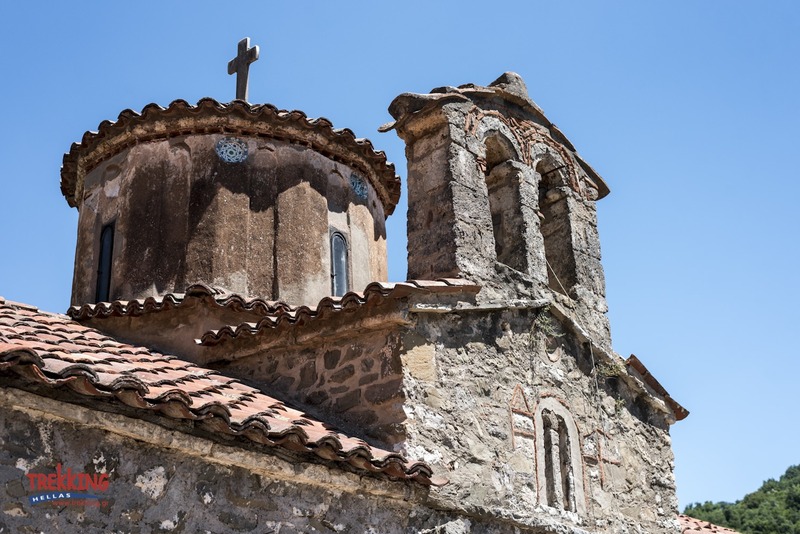 We drive through the wide Thessalic plain to Kalambaka, the small town at the foot of Meteora rocks. In this far-off corner of Thessaly, there is a strange and magnificent region which is justly famous as one of the wonders of the East. 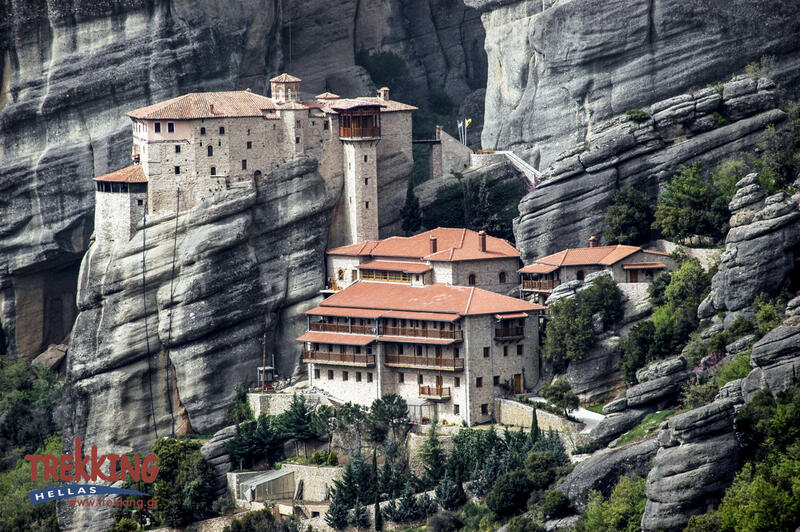 Just above Kalambaka stand the famous Meteora Monasteries, glued to the sides of the rocky pinnacles. Distance: 230Km’s, about 3,5 hours’ drive. 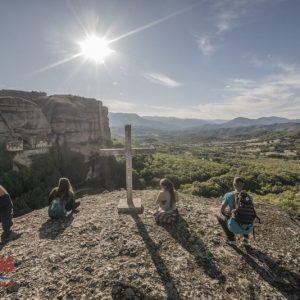 We hike amongst the gigantic rocks of Meteora rising perpendicularly 250-300 m from the point where the Peneus river emerges from the deep canyons of the Pindos range. We swing between the sky and the earth, unworldly, mysterious, bearing a unique religious ecstasy. We walk around western Meteora, following the same old paths the monks used to use, which wind their way amongst the tall rock – towers. 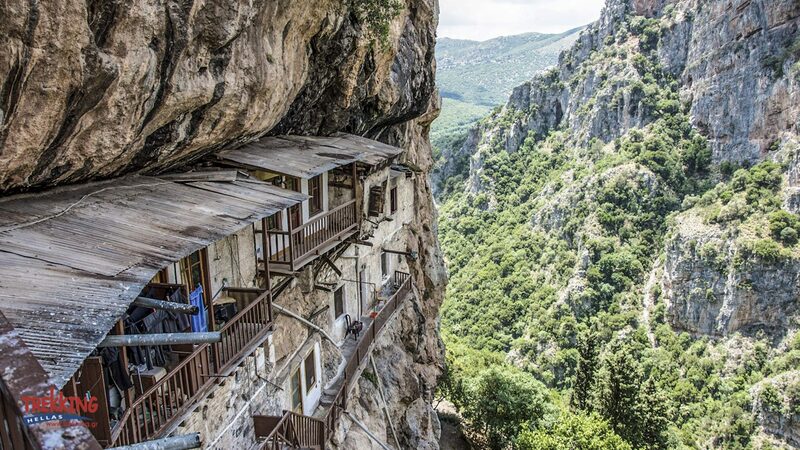 These paths go up to the rocks and take us to the cliff top monasteries, the high places of the Greek – orthodox spirituality. 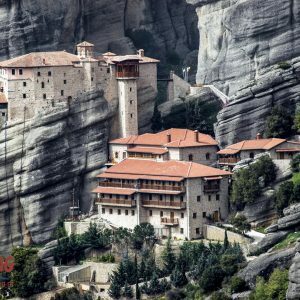 We visit the world-famous monasteries of Meteora, Megalo Meteoron and Agios Stefanos. After lunch, we return to Athens. Distance: 350Km’s, about 4 hours drive.